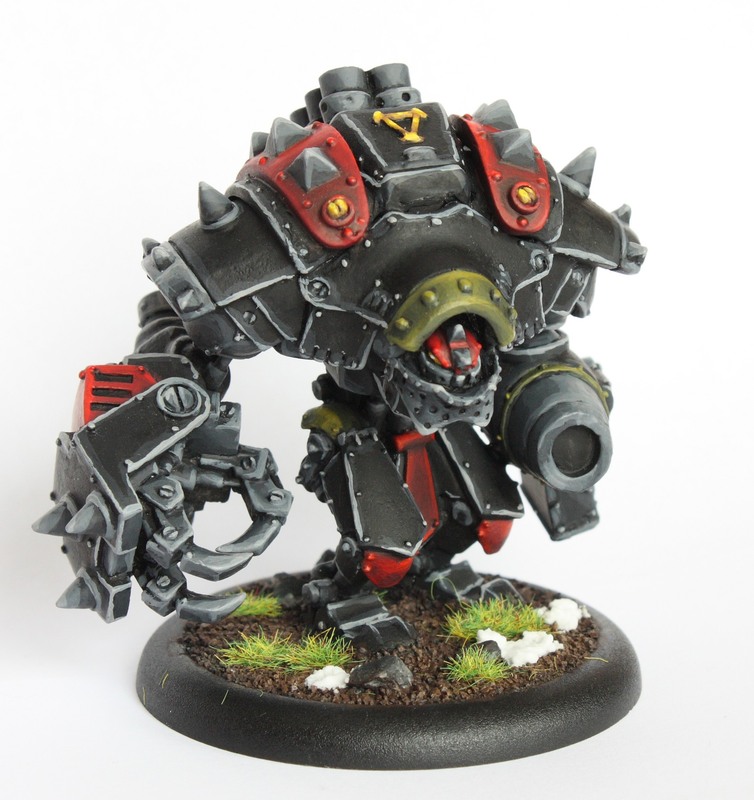 Welcome to an update of this blog after a long pause (both in updating this blog and playing Warmachine/Hordes). I hope to do more frequent updates the coming month, as soon as I’ve tidied up my desk to paint again ;). Due to a lack of spare time at the moment, I will keep this one rather short. Just take a look at the battle impressions and read the captions. Photo quality isn’t as great as usually, cause I used my phone. This game was played in our local tabletop gaming club last Sunday. 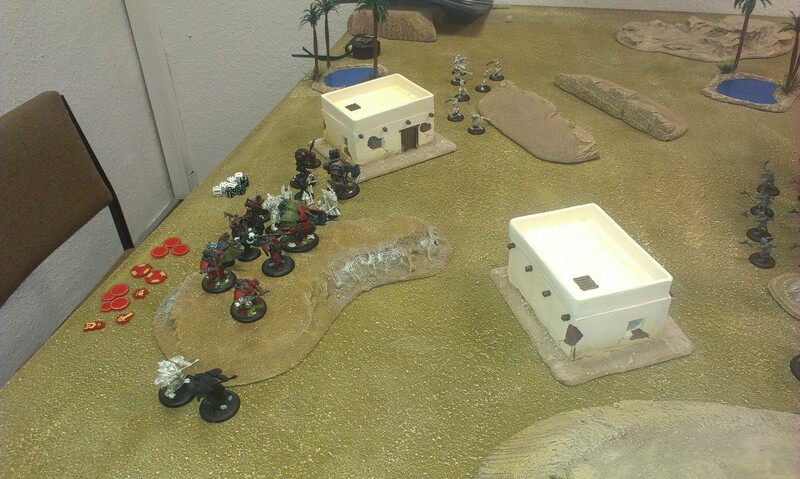 The set up was 50 points with no specific scenario. I played against the Mercenaries (Four Star) of my friend with a standard Khador list. Some of the Mercenary models are none PP models but quite easy recognizable as what they are (Steelhead Halberdiers and Cavalry). Roccinante is a Mule. The Mercenary Caster was Damiano and I played a melee-focused eButcher list. Khador setup. Mainly two waves clumped in the middle. Doom Reavers on left flank. Honestly, I should call this project Solo Painting Month instead of Solo Painting Week. There is not enough spare time for painting at the moment. Nevertheless two of the three solos are finished as you can see in the picture below. The Solo Painting Week will actually take longer than just one week. There is not enough spare time at the moment for painting. Nevertheless there is some progress to show. Both Minions have their basic colours done and only some washes and basework left. The Marksman will need some more effort to be completed. I’ve made some visible progress since the last post two days ago. The basic colours on Saxon Orrik and Alten Ashley are almost done. The Marksman takes a bit longer with the more sophisticated painting approach on my Khador models. Started a little later than I wished to but last week and the weekend were to busy and my Black Ivan conversion took longer to finish than expected. I just realized how similar the three solos are. All carry a rifle and wear some sort of mantle. I will try to give them each a distinctive colour scheme (the Marksman will fit my other Widowmakers). Alten will wear different shades of brown and grey while Saxon Orrik will get a scheme similar to the PP studio scheme. Here is a pic of the progress made yesterday and this evening. It’s interesting to see how painting white eyes with black pupils gives the faces a lot more character. Here it is, the outcome of the full metal Black Ivan conversion project. This conversion is based on the classic destroyer chassis instead of the plastic kit. I’m quite happy with the result. Take a look at the front and back picture of the finished ‘jack. Below I added a third picture comparing Black Ivan with a classic Destroyer. The Destroyer is also the first ‘jack I painted about 5 years ago. You probably can spot some progress in painting quality.